Abstract: Arylidene polymers or by other words polyarylidenes have been prolonged studied over wider range of years with a significant attentions in the past few decades. The preparation of such polymers produces a variable number of polymers that mainly containing different functional groups. The type of these polymers is also mainly based on significant developments in the synthesis methods. A versatile number of arylidene monomers and pre-monomers are reported in the literature which illustrated in producing different types of polyarylidene. Arylidene Polymers can be utilized and applied over a floppy range of applications, such as in chemistry, materials science, chemical engineering, biology and recently in environmental remediation. 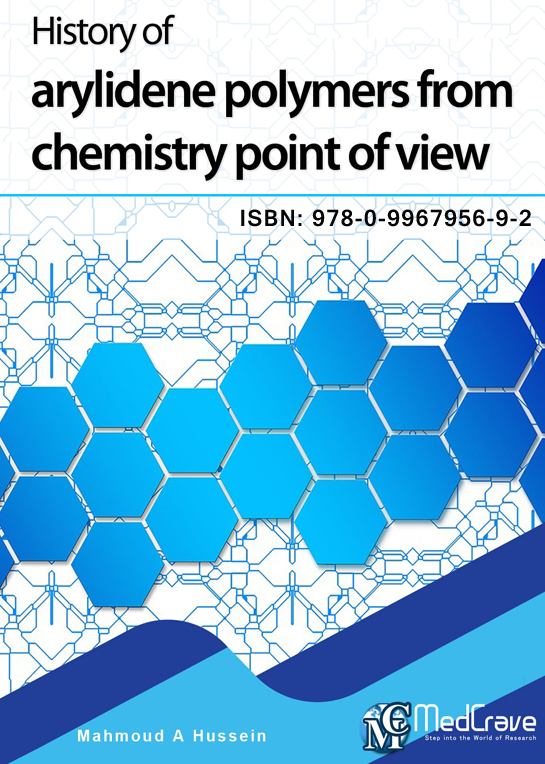 Therefore, the current work shows a simple introduction to the chemistry of arylidene polymers and their variable characteristics. The work describe in this work focus on the syntheses and characterization of arylidene polymers as a continuation of our study on the synthesis and properties of different new polymers based on diarylidenecycloalkanones possessing some interesting properties, attractive morphology, liquid crystalline behavior, conducting properties and many other properties. Such variable types of arylidene polymers can be easily applied in different field of applications. A comprehensive overview to the synthesis and characterization of various types of arylidene polymers with a special attention to arylidene based unsaturated polyesters, polyketons, polyurea derivatives, polyamides, organometallic and other arylidene based polymers have been presented from chemistry point of view. More particularly, a special attention has been given to the morphological changes that have been detected upon changing the type of arylidene segments and its corresponding functional groups as well. In addition to solubility, viscosity, thermal behavior and other properties that may also changed upon polymerization.